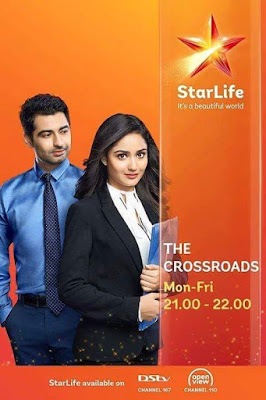 Check out teasers of The Crossroads this December showing on StarLife channel. Asad pours his heart out to Radhika on Rose Day but is met with a rude shock! Ramkatori gets Leela drunk on thandaai and tries to get the truth about her and Subhash! Pyaremohan records their conversation. Adarsh gets ready to go on a date with Vanshika. Haider and Zubaida are worried as Asad does not reach home. Adarsh refuses to dance with Vanshika. Swadheenta learns that Geeta is Banwarilal's daughter. Subhash holds Swadheenta captive. Adarsh and Suhasini try to reach out to Swadheenta. Adarsh tries to rescue Swadheenta. But, Subhash and his associates hold him captive as well. However, Adarsh, Swadheenta, Banwarilal and Sudha escape from Subhash. Swadheenta and Adarsh tend to each other's wounds. Asad refuses to meet Radhika. Swadheenta tells Haider and Zubaida about Sudha's case. Suhasini and Swadheenta go for lunch. Subhash comes with the police, looking for Sudha. Swadheenta tells the inspector that Sudha is in protective custody. Suhasini informs the judge that Sudha's DNA report matches that of Banwarilal's. Banwarilal's friend, Kabir meets Swadheenta. Sudha refuses to recognise Banwarilal! Suhasini finds an intimidating letter meant for Sudha and terminates Swadheenta for neglecting her job. Sudha tells the judge about the letter. The police arrest Subhash when he tries to escape. The judge sentences Subhash and Leela. Suhasini reappoints Swadheenta as her assistant. Simmi suggests Suhasini to get Vanshika and Adarsh's engagement date fixed. Asad tries to avoid Radhika. Jaideep and Abhay ask Adarsh if he is happy about getting married to Vanshika. Adarsh visits a temple in the hope of getting some clarity about his marriage. There he bumps into Swadheenta. Simmi is shocked to hear that Adarsh wishes to marry Vanshika. Asad's friends push him to attend the youth festival. Swadheenta visits Suhasini's house to help her select a few saris and learns that Simmi is Ahuja's daughter. Manohar confronts Suhasini for not telling him about Swadheenta. Meanwhile, Asad refuses to become Radhika's dance partner. Bundela tells Manohar that Yash's marriage has been fixed with Col. Deshmukh's daughter. Meanwhile, Mrs Bundela asks Adarsh about Swadheenta, on seeing their photographs. Suhasini sees Simmi keeping an envelope on a tray. Suhasini forbids Ahuja from entering her house. Ahuja requests Adarsh to mend Simmi and Suhasini's relationship. Simmi has a seizure and Adarsh confronts Abhay for hiding about her medical condition. Abhay reveals to Adarsh and Jaideep that he married Simmi in the fear of losing her. Adarsh, in turn, confesses that he loves Swadheenta. Adarsh proposes to Swadheenta. Will she accept it or turn him down? Adarsh is heartbroken to learn that Swadheenta is getting engaged. She tells him that her father always wanted her to marry his best student, Jeevan. Later, Adarsh watches Jeevan practise Bharatnatyam. Adarsh take Bharatnatyam lessons from Swadheenta’s father, Ramakrishnan. Adarsh tells Swadheenta that he intends to become the best student in order to marry her. Ramakrishnan visits Suhasini's office to invite for Swadheenta's engagement. Adarsh struggles to perform the Bharatnatyam steps while taking dance lessons from Ramkrishnan. Later, he rushes to office as he is running late. Jaidev informs Jaya that Adarsh loves Swadheenta. Swadheenta watches Adarsh practise Bharatnatyam. Adarsh wants her to realise his love for her. Swadheenta is speechless when Adarsh asks her why she is hiding his visits to her house from Suhasini! Adarsh puts the engagement ring in his pocket when Jeevan drops it while dancing. Swadheenta and Jeevan go to a jewellery shop. Adarsh grabs Swadheenta and puts a ring on her finger, while Jaya prevents Suhasini from seeing them together. Swadheenta decides to keep her promise to Ramakrishnan. She requests Adarsh to stop coming home. Jeevan finds Swadheenta folding her hands before Adarsh. Adarsh tells Ramakrishnan about his wish to compete against Jeevan. Jeevan finds out about Adarsh's desire to compete against him. Later, he tells Swadheenta that he needs to win her love by beating Jeevan in the dance competition. Asad runs into a car on learning that Radhika is getting engaged. Radhika is sad to see Asad in the hospital. Jaya, Abhay and Jaidev stop Suhasini from seeing Adarsh rehearse! Meanwhile, Ramakrishnan holds a Bharatnatyam competition between Adarsh and Jeevan. Adarsh and Jeevan compete in a contest. Adarsh tells Ramakrishnan that Swadheenta has agreed to marry Jeevan only because of the promise made to him. He then tells Swadheenta that she has only a day to decide if she wants him in her life. Asad tells Swadheenta about his plan to help Radhika escape from her engagement. Adarsh helps Swadheenta to find Radhika's house. Yash stops Radhika from eloping with Asad. Swadheenta stops the police from arresting Asad. Swadheenta convinces the police to release Asad. Asad learns about Yash's sister, Vanshika's engagement with Adarsh. Adarsh gets ready for his engagement. Suhasini tells Adarsh about the incident at the Bundelas' house. With Asad's help, Swadheenta reaches Adarsh's engagement venue and professes her love to him. Adarsh tells Manohar that he doesn't love Vanshika. Radhika, too musters the courage to tell her father that she loves Asad. Swadheenta apologises to Suhasini. Suhasini refuses to listen to Adarsh. Haider tries to convince Ramakrishnan and Revati that Adarsh is a good boy. Later, Swadheenta and Adarsh express their love and embrace each other. Adarsh and Swadheenta go out on a long drive and spend some romantic time together. Ramakrishnan and Suhasini refuse to listen to them. Jeevan convinces Ramakrishnan to speak to Suhasini. Ramakrishnan and Suhasini have a showdown after which he refuses to compromise for Adarsh and Swadheenta's marriage. Adarsh confronts Suhasini for insulting Ramakrishnan. Yash tells Asad about a possible terrorist threat on Delhi. Suhasini stops Jaya from leaving. Radhika tells Asad that his friends are taking advantage of him. Adarsh and Swadheenta decide to stand by each other. After pondering over Jaidev's words, Suhasini and Manohar visit Ramakrishnan. Adarsh and Swadheenta listen to their parents discuss about their marriage. Jaya tells Jaidev that she disclosed the reality of their marriage to Suhasini. Later, Suhasini tells Manohar about her plan to separate Adarsh and Swadheenta. Swadheenta asks Haider to let Asad's friends stay at his flat. Suhasini postpones her hearing to meet Ramakrishnan to discuss SwaAdarsh's engagement and as expected, there is friction again between the two sets of parents! Haider asks Asad's friends to get police verification done before shifting. Abhay and Jaidev plan a surprise party for SwaAdarsh. Abhay signs the verification form for Arvind. Later, some masked men with guns disrupt the party. Abhay and Adarsh get the intruders arrested. Asad unaware of his friends being terrorists gives them the keys to the apartment! Suhasini fixes the SwaAdarsh's engagement. Manohar tells Jaidev about the arrest of a terrorist, Allan Broad. Swadheenta and Adarsh go shopping for their wedding. Adarsh fails to recognise Arvind in his new look. Manohar visits Allan Broad in jail. Suhasini invites Ahuja to SwaAdarsh's engagement with a motive. Suhasini and Manohar invite Ahuja and Ramakrishnan for their anniversary celebration. Swadheenta and her family arrive at the party. SwaAdarsh vow to love each other forever. Suhasini asks Simi to keep an eye on them. Ahuja suggests that Ramkrishna perform Bharatnatyam at the anniversary party. Ramakrishnan slaps Ahuja when he offers him money for his performance. Swadheenta stops Simmi from slapping Ramakrishnan. Suhasini tells Ahuja that Ramakrishnan will have to apologise to him. Ramakrishnan refuses to do so. Swadheenta stands by Ramakrishnan. However, Adarsh feels that Ramakrishnan should apologise. Suhasini calls off SwaAdarsh's engagement. Abhay tells Asad his plan to make SwaAdarsh meet. However, SwaAdarsh end up getting into an argument with each other. Ramakrishnan calls Ahuja to Suhasini's house. Ramakrishnan apologises to Ahuja. Suhasini learns that Ramakrishnan is allergic to alcohol. Swadheenta arrives with her family for the engagement. Swadheenta confronts Suhasini for deliberately serving alcohol at the party. Swadheenta confronts Suhasini and tells her that she loves Adarsh very much. SwaAdarsh exchange their rings. Suhasini complains to Adarsh about Swadheenta blaming her for conspiring against Ramakrishnan. Adarsh confronts Swadheenta for lying about Ramakrishnan. Manohar gets Allan Broad's signature on a few documents. Haider tells Swadheenta that he will file a PIL against Broad. Swadheenta apologises to Suhasini for misunderstanding her. Arvind takes pictures of the places he intends to plant the explosives at. He plans to plant a bomb on the day of SwaAdarsh's marriage. Swadheenta brings lunch for Adarsh. Simmi steals Adarsh's engagement ring to test Suhasini. Simmi decides to ruin Adarsh and Swadheenta's relationship. Yash tells Asad about the Delhi attack. Simmi faints on learning about her health reports. Jaidev tells Jaya that Simmi has been admitted to the hospital.